Its a "fraternity" of like minded Morones fishermen who will keep this site active. This is really an online Striper Magazine with good stories, fishing how to's, personal anecdotes, in short every bit as good as IN Fishermans rag. Very well put Tony. I will still be here in 16 months if you all will have me. I don't fish for stripers that much at all but truly love those mean morone. There is the issue of those that are very far away from good fishing not being able to fish with fellow soupers, or provide any good info. I think this enforces the idea of having select members. If I give the 12 dollars, it will be benefiting those members of the soup that are close. Like I said about my site, there is a special section reserved for members that are invited and voted on. The other members dont even know there is a special section(until now I guess) until they get an invitation. Everyone is happy. The ones in the special section are encouraged to post in the open forums and they have no problem doing so. Theres alot of razzing going on along with very good specific fishing spots and fishing related info. There is still info in the open forum, but the guys in the special section are very close, like fishing buds, and are willing to give up the very good info. We don't have a fee to join, but you could do it that way. If members think they might be missing out on good info, I'm sure they will fork out the cash to join the select group. Shawn this is your site and you can do whatever you want. I know you said that this site is for us, but I respect the fact you provide this site for us. Thanks Shawn. Everyone's input is VALUABLE and that is what makes the Soup the best!I honestly think that having a section where you have to be voted in or invited would not go over real well,mainly because of our every day lives we are drowning in politics. Why not just pay the $12 and have access to it all,I would be glad to help out anyway that I can! We ALL are in a select group....thats why we are in the SOUP bowl!! sounds like tony has some good ideas. "slow down, We're in a hurry"
Shawn you gonna be in town anytime soon? Not a big check writer would rather pay cash. But will write one if you insist!! I spend a pile of money every year to catch a fish, only to take a picture with it and then turn it loose (sounds really crazy when you write it down). What's $12 more a year, that's like throwing a deck chair off the Queen Mary. However, the information collected on here over the years was given freely by many and to begin charging for it would be like collecting charitable donations for one purpose and then in the end using 'em for something slightly gainful. I'm struggling with that and not the financial part at all. This forum is quite unique in the quality of information that some great anglers have shared, there really isn't anything else out there that's even close. Even though I'm sure there are nothing but noble intentions for the membership fee, from what little it has been touched on, it appears like it will only benefit a small fraction of the members (gathering, fish off, soup propaganda, moderators time etc...). Will that make the soup better? It will for a select few. Operating a no ad forum is a labor of love and I'm positive it will not go away, however it will never be like it once was either. Is that a good thing? Time will tell. Merry Christmas to all you finaddicts out there!!! Actually, moderating is done in my spare time and on a volunteer basis...I don't get payed to read every single forum and correct what needs correcting. Shawn still handles the majority of work. I was about to spend some major money out of my own pocket. The photo contest was my idea, so I told Shawn I would pay for the prized jacket that will be awarded. He told me I could save my money and it would be funded through the dues. How many of you have participated in the contest??? I think alot of you guys are getting this all wrong. Everyone will benefit from the Soup, so long as they choose to do so! I think this site is worth $12 a year and I will end up paying it. I've learned a ton from this site in only a few months and I think the striper related information here is second to none on the web. My only concern with charging is the long term effects on the site. I think many people will pay the dues for next year. But what about the year after next and so on. Eventually, a lot of people may just say the heck with it. I think one of the great things about this site is the reports from lakes and rivers all over the country. No other sites that I know of have that. I think if you push a lot of those people away, you'll find you may be stuck with just Ga. and Tenn. reports, which is where a lot of the members come from and probably are the one's who are most willing to pay the dues. But again, it's Shawn's site, so he can do whatever he wants with it, and I'm going to support it either way because I've certainly learned from it and hope to continue learning from it. Just my 2 cents. Posted: Tue Dec 15, 2009 7:30 pm Post subject: What's free? Jim, you talk about a "free" site, but how many of us have bought a $12 spool of P-line? I don't think the $12 will strap anybody financially. Most of the people on here could probably cut out a few days of smoking or chewing or drinking and do themselves a favor and have the site paid for. Maybe it's just the act of striking a check and having to put it in the mail amongst all of the other hub-bub of a regular day in the lives of most of us that people are against. I'm very pleased so far with the number of members who have decided they want to stay on board and help provide a better Soup. There is an important part of this website which MOST members are missing out on. That's the GIVING part. No forum would ever be anything if nobody made a post. Those of you who already know everything don't need to be here. Those of you who don't want to converse with some of the best striper fishermen in the world don't need a Soup membership. Those of you who never fish, therefore never post reports, don't really need to be here UNLESS you enjoy living vicariously through those of us who DO fish and DO post REPORTS. Everybody benefits from GIVING, especially those who are the givers. If you are all take, shame on you, for the 100th time. It's my opinion that a good forum will stay a good forum even if all the lurkers are gone since nobody even knows they exist anyways. I'm not discouraging any members. If you are a LURKER (or "non poster" to be P.C. ), you're welcome to stay on and pay your dues and remain that way, but it's gonna cost you a little bit to just read. Talk about participating. That is the SPIRIT of this forum. I want to see everybody involved. Not everybody wants to play, but those of us who do make the 'Soup what it is. The competitions and gatherings are just another way to participate. One guy from California came to last year's get-together just to meet and shake hands with those of us who were there. While others who live only a couple hours away OR LESS weren't able to make it for some reason or another. This year the gathering will be planned 4-5 months in advance so nobody can schedule a dumbass tournament around it. The photo contest has been pretty lackadaisical for the most part, but the prize will be a good one for the winner who put forth the small amount of effort required to meet the requirement. Some folks can help us come up with some ideas for more things to do. Maybe a cast-netting/bait keeping/boat rigging day somewhere around Allatoona where everybody can look at everybody's rigs (BOAT rigs) and meet and greet and have a fish fry or something. I'm open to any suggestions. 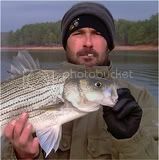 We should have the most active activity list around since we have one of the most active striper forums anywhere! The yearly dues will benefit all. And of course, like anything else, they will benefit those who participate more than those who don't. Amen, That's what it's all about. New membership may decline and thats the only drawback. If you cant afford it skip 2 meals a year. You be willing to take an IOU????? Or how about we start a tab like at the bar and you just add to it every year and when it gets to where it actually is worth my time of filling out a check we even up.....Anybody second this motion????? It probably takes you longer to open this site and read one post than it does to write a single check - learn to multi-task. It was just as apparent from your original post that you work 80 hours a week as it was a joke. Y'all just kiss and make up. 80 hours is a lot, but it still leaves time in the year to write a check for the Soup somewhere in there. Rockfish, the comment was a little tasteless. Seems like he was joking on his original post as well. Santa's watching you guys! You guys may not know this, but I consider myself…a bit of a loner. I tend to think of myself as a one man wolf pack. But when I found the Soup, I knew I was no longer alone ,there were many who also suffered from this addiction and I was no longer on my own. And my wolf pack, it grew by not just one. So we are 924…so there was 924 of us in the pack. I…I was alone first in the pack, and then I joined yall later. I thought…wait a second, could it be. And now I know for sure, I just added 924 more guys to my wolf pack. 924 of us wolves running around together, in Lake Striper Soup looking for stripers and beer. So tonight, we make a toast! I'm a little hesitant only because my wife will get her hackles up. 12 bucks is alot of money in my house. A dollar a month is a pretty good deal. As for getting people to post reports, It's hard to get people to post if they don't get to fish in the first place. You guys are truely blessed to have all that good striper fishing so close. I post all my fishing reports. My last one was about fishing for drum if that tells you anything(see my big goo in the other fish section). I get to fish for stripers once a year and two if I'm real lucky. I live in a striper dead zone. No stripers of any good amount around here. I have to drive 4 hrs one way to get to the nearest good striper hole. I do love to read the reports you guys give though. Makes me think there is hope for me to get in on some of that good fishing some day. I came that close to fishing with Tim but then he moved. I still want to get with Ezell on Norris and Cherokee. I still remember reading Shawns reports many many years ago on another site. Man that brings back memories. It's hard to give all that up just because I cant aford 12 bucks! I will have to dip into the smack slush fund. Problem is, there isn't much in there. Brett, with all due respect to the fact you don't know Scott's circumstances, I'll ditto his reply, Smack Tackle makes some fine lures, and when Scott's partner posted a week or so ago he had his first paying remodel job in 3 weeks, that pointed out to me the dismal economy in their neck of the woods, just an hour east of me here in Cincinnati. Scott works full time at Smack, but doesn't get paid full time, from what I understand. (hope this isn't TMI, Scott). So, buy Smack's lures, and Scott and Todd and Wade will have the $.03 a day for themselves as well as being able to donate for others less fortunate to subscribe as well, if they choose. I'm a little torn as to the $12 also, not because it's a lot of $, but because as others have stated, there's other ways to raise operating funds. It is an excellent site, with excellent members, I've learned a lot, and like Scott, don't have many opportunities to put the knowledge into play, due to scarcity of Stripers in this area. I still like to browse and read and look at pictures, and have made some great friends here, so again $12 isn't much. Other than Smack's forum, I come to Striper Soup more than any other forum, free or not. One concern I would have, is if I paid my $12, would I be censured for posting from my Christian perspective? I've been corrected in the past for using Scripture in the Rants and General Discussion areas, where it plainly says "say anything you want" in the description. Am I free "to be me" when I pay this $12? My .03 cents per day and some $ for a hat and stickers is in the mail today. I am late getting this sent, but my 2010 dues are in the mail. I also sent $6.00 fo two Medium Stickers if there are any left. Still got a few of each on the stickers! I'll letcha know if they run out. "Not at the table Carlos"
The bottom line is this; you can not buy a book, a video or anything else at any price that will even come close to the wealth of information that is in this soup pot. Ever tried to ask a book or video a question? $12 is a miniscule price to pay. A free trial period might be a good thing and maybe even a limited access area but a fee to get access to the real nuts and bolts is worth it. I may not say too much but I read and study almost everything that gets posted about the how to stuff and it's priceless. Most of the points made so far are good ones but the Chef does own this site and has maintained it for many years at his own cost so a little help shouldn't be too much to ask if he so chooses. Dang forgot about this. Will send dues out tomorrow or Friday. Watched your DVDs recently, Diehard. Those are enough to make a grown man cry. One day I'm gonna catch one like those and it's going back in the lake too! I finally got back from the cold west to the colder and wetter south....check is in the mail (today). what no lifetime memberships ???? I am also one of the fellow soupers that does not post much. Being from the north (pa.) we do not have the entire year to fish. In fact ,our local lakes are already freezing over. Thats one of the reasons i started coming south a few times a year in the spring to fish.Reading on this site during the winter sure does help with the cabin fever. But anyway, my dues are in the mail today. along with extra money for a few stickers to put on the new (to me) rig. I have looked at a lot of fishing forums and this one is by far the best i have ever seen. Looks like I counted 55 out of 934. However it does look like most of the regulars made it. Shawn have you heard from some of the others, like Tony, Red over White etc? Dirk, I feel the same. I have learned alot from reading Tony's post. Not only fishing but outboards, and other fishing related stuff. i really like this pot of soup. I'm new to the Soup. I posted an intro, and will be mailing my dues tomorrow. Also, if still available, I will be including some $$ for stickers. Hope to see some of you guys out on the water. First post. Count me in on dues! As of today, we are 109 members strong.